I always like it when the Eastern bluebird is present at the conference site. A bluebird trail was not only at the Watershed Center, but also at the field trip on Sunday at Lake Springfield, so we started each day hearing and seeing our beautiful Bluebirds! As far as I am aware, our youngest conference attendee this year was Katy Samuel (14) and our most senior attendee was Russ Heindselman (87). I think that is terrific! I also think the 2015 Bluebird Conference was a great example of how MOBS aims to work with other fine conservation organizations in order to enhance conservation efforts everywhere. Individuals from at least three other conservation organizations contributed to the success of this year’s conference. Jessica Blomenkamp and Greg Swick are two of those individuals. Others are mentioned in this issue and we thank them all. The Friday Bluebird Banquet was the beginning of a wonderful conference. 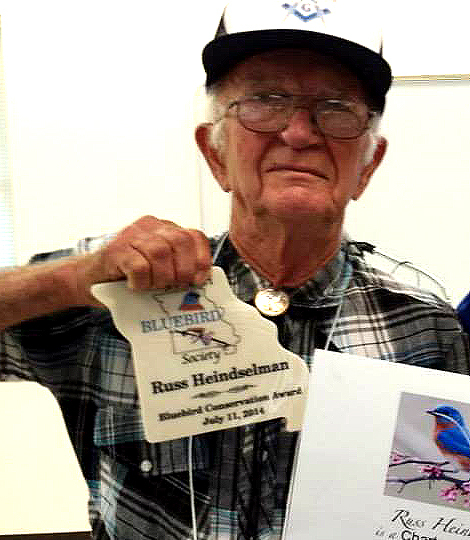 This year’s “True Blue Service Award” had a special meaning for me because it went to two people that played an important role in my involvement with the Missouri Bluebird Society. They were actually instrumental in getting us on the right track. Steve and Cheryl Eno gracefully accepted a well deserved award for all they have done to help MOBS. A “Certificate of Appreciation” was also given to Bluebirds Across Nebraska for their help in starting our Nest Box Grant Program with a very generous donation of boxes and poles. We know the history of Bluebirds in Missouri is rich in tradition. After Regina and I spent several months accumulating information about the bluebird conservation projects of Garden Clubs in Missouri, we are still learning how much we did not know! The “Federated Garden Clubs of America” were awarded the MOBS Bluebird Conservation Award for their important contributions to bluebird conservation dating back to the late 1930s and early 1940s and their local Southwest District was awarded a Certificate of Appreciation as well. The dinner was catered by Bambinos Italian Restaurant consisting of a choice of four pastas, along with salad options, while MOBS members supplied a wide variety of desserts. Bambinos was recommended by members of The Greater Ozark Audubon Society and was an excellent choice fora nice meal. All left over food and snacks from all portions of the conference were donated to a local benevolent organization, “The Kitchen Inc” (www.thekitcheninc.org) via the assistance of our host hotel, the Greenstay Hotel & Suites in Springfield. The Saturday morning bird walk around the Watershed Center resulted in 39 birds which included Pileated woodpeckers and bluebirds. While the walk was going on MOBS volunteers were busy getting the room prepared for the presentations and Larry and Mary Dobson, with the help of Ann Smith, were busy checking in more items for the silent auction and raffle. I want to thank new member Greg Samuel for graciously leading the walk and finding such a good variety of birds. I look forward to hearing more about Jessica Blomenkamp’s trail (our first “Save the Clutch” baffle recipient and our wonderful keynote speaker). 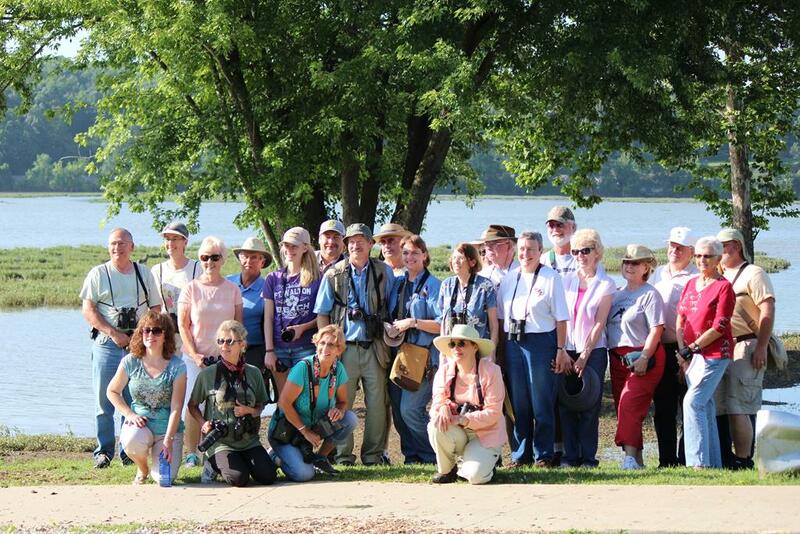 What a spectacular program the Green Leadership Academy for Diverse Ecosystems (GLADE) is! Jessica was a graduate of that program and it was a special treat to have the program’s Director, Greg Swick, both present information about GLADE and introduce Jessica. conference . So many folks pitched in to help out and it was greatly appreciated. Thanks so much also to our terrific speakers. I enjoyed every program and heard great comments from attendees. I look forward to seeing everyone at the 2016 Missouri Bluebird Conference next June in Jefferson City. It will be MOBS 10 year anniversary – you won’t want to miss it.